Police are to use new powers to target intimidating groups of youths and drug addicts in a north London borough. A 'good behaviour zone' comes into effect on Tuesday in Somers Town, Camden, an area which has had problems with drugs and loutish behaviour. Powers under the Anti-Social Behaviour Act mean police can disperse groups for up to 24 hours under threat of arrest. Police say they will not "target all young people" but those with a history of disruptive behaviour. Ch Supt Tony Brooks said: "There will be youngsters in the area playing and behaving in a way which doesn't cause any problems to the residents or the community, and that is welcome. "But if people congregate in a manner that causes alarm, harassment or distress to residents, then the police have another power to tell them to disperse from that area." Extra police will patrol the zone's boundaries, which will be marked with signs, to stop groups moving into neighbouring areas. Unaccompanied children under 16 could also be forced to go home by 2100 BST. Somers Town resident Susan Close said: "Somers Town is a lovely place with some amazing people, but it has a history of problems with youth disorder and drug addicts which... seriously affects quality of life for people who live here. "This summer we want to stop the trouble before it starts." 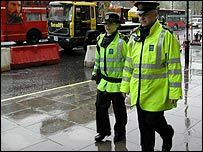 A second zone will come into force in Camden Town next week, specifically aimed at "drug-related anti-social behaviour". Earlier this month, Red Card Zones were introduced in Lambeth, south London, as part of a similar crackdown on street crime.